After checking in with the Cassandra Cain Batgirl yesterday, I decided to stick with the bat-books of the early 2000's... at least for today. 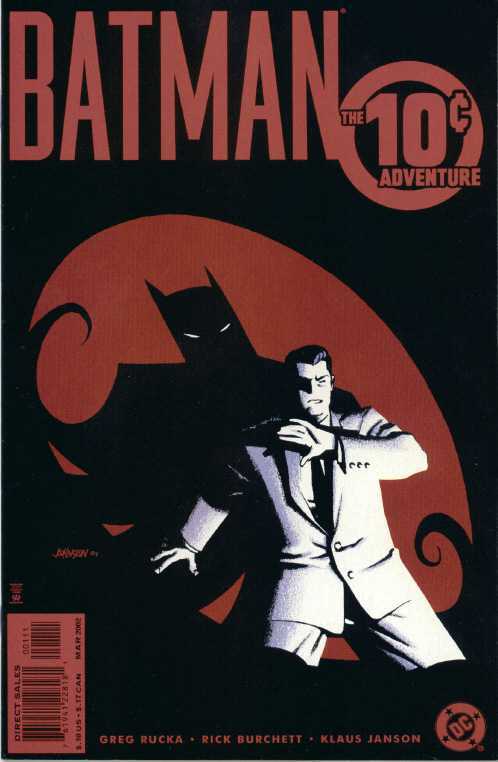 We're going to discuss the opening chapter to the big Bat-Event of 2002, Bruce Wayne: Murderer?... which would continue into Bruce Wayne: Fugitive. It's just another reminder of how fresh and interesting the New Gotham era Batman family of books could be. I remember the price stunt being a pretty big deal at the time... an entire Batman story... that mattered... for one thin dime. DC would revisit this novelty pricing for Superman: The 10-Cent Adventure and a few years later for Batman: The 12-Cent Adventure, though neither of which were as good as this one. Even across the street at Marvel they played the game (and one-downed their Distinguished Competition) when they released Fantastic Four (vol.3) #60 for... nine-cents. The early 2000's were a weird time in comics... much more fun, and much less serious than today, that's for sure. Anyhoo, let's get down to it. We open on that familiar to the point of cliche scene where a young Bruce Wayne kneels on crime alley before his fallen parents... we've got blood... we've got pearls... you know the story. That said, I really can't harsh on it all that much here. This is a 10-cent issue, and as such an invitation to new and lapsed readers to "jump in" on the caped crusader. What may be trite to seasoned comic citizens like myself, is necessary table-setting for an incoming audience. Greg Rucka's writing makes this scene more than what a lesser writer might... from that tragic night, we continue through Bruce's adolescence and ultimately to his profound meeting with a certain "rat with wings". Year One was still a thing at this point. We move into narration from Sasha Bordeaux, Bruce Wayne's bodyguard... and latest member of the DC Universe to get "the secret". She found it odd that her client would vanish each night... and decided to follow up on some hunches. In so doing, she also found herself falling in love with him... that can't possibly end well, right? We learn that with her newfound knowledge, she has been drafted into Batman's war on crime. This is a piece of the story that I had completely forgotten. We get a shot of the Jason Todd's Robin costume to clue new readers in to what could potentially happen to a Bat-associate. Sasha remarks that every so often of late, Batman has been looking in on a woman called Vesper Fairchild... a former squeeze of Bruce Wayne's. She continues, stating that Bruce broke things off with her when things were "looking serious", which is pretty much what Bruce does. Sasha struggles with whether or not she should try and talk to Bruce about Vesper... after mustering the courage to finally say something... well, there's an explosion. Ain't that always the way? The next stop on their patrol is a night club called the Wyld Night. Batman is able to save all of the occupants... except one. This appears to deeply affect Batman, which isn't a surprise to us... but, remember, this is Sasha's recounting of the events. This is likely her first time seeing Batman "miss" one. Next, our dynamic duo stops at the Zoo where a tiger had gotten out of its cage. Batman is able to sooth the savage beast and get her to retreat to her pen. Special attention is paid to Batman's words... he talks as though he's afraid someone would hurt the tiger, and not the other way around. This is a very busy night... we've got a firefight on a bridge between the GCPD and the Russian mob. Sasha mentions here that Batman is careful to contain his rage when fighting bad guys... and more importantly, he never kills. Not sure if this is something she just knows, or something she has gleaned from her recent observations... but it's important. Next we get to watch Sasha go solo. There's a jumper across town at the same time as a mugging nearby. Our heroes decide to divide and conquer. Sasha takes down the mugger with ease. Later back at the Batcave, Sasha checks in with Bruce. Even though the night was a definite success, he can't seem to shake the loss of a single life at the night club. Again, this is important in illustrating how Bruce/Batman values human life... and is a great way to frame what is to come. Speaking of "what is to come"... Bruce and Sasha head upstairs where they come across the dead body of Vesper Fairchild! What this issue does is pretty great. It brings elements of the past, present, and future together in an organic way... that didn't feel like we were just getting a pile of exposition dumped on us. Of course we open with the blood 'n pearls... this is a Batman story, after all. Being as though this was a 10-cent dealie, you gotta imagine this was intended as a book with which DC wanted to use to grow their readership. It has to be "new reader friendly". I definitely feel this issue was successful in that regard. The present is represented in Sasha Bordeaux, who for a time was Bruce Wayne's bodyguard... if you can believe that. I always dug her character, she was almost a foil to Bruce in that she got a bit nosy about his extracurricular activities... and was actually able to suss out the secret. In so doing, she also... falls in love with him. You know how that be. I'd actually forgotten that she had taken on a masked identity... though without a proper superhero name, it appears. I feel she works well both in and out of the costume... and really disliked it when she was pulled from the Bat Family into Greg Rucka's relaunched Checkmate series post Infinite Crisis. The future is pretty self-evident. We got us a dead girl in Wayne Manor. This is the perfect kick off point for a season-spanning whodunnit epic. This was a joy to read... and I remember back some, jeez, 14 years ago, this was a joy to collect and follow. Rucka's writing is as good as you would imagine, even during pages of exposition, it isn't dull. Rick Burchett's art is also perfectly fitting for this story. I actually had to do a double take at the credits page, I thought it was Scott McDaniel at first blush. Perhaps it has something to do with the inking and/or coloring... it looks like something out of an early issue of Nightwing... which is a good thing. Overall... even though I enjoyed this immensely, it's a hard one to recommend. It is the opening chapter to a... if Wikipedia is to be believed, thirty-nine part story. That's one hell of an investment of time, effort, and money. I personally feel it's worth it... but I'd hate to send anyone on a shopping spree. I will say that both Fugitive and Murderer? are handily available digitally... so if the mood strikes you, give it a go. If you're still on the fence... The 10-Cent Adventure itself is available digitally... FOR FREE. Enjoy!